U.S. Treasury Secretary Steven Mnuchin unveils the seal for the new U.S. embassy during the dedication ceremony of the new U.S. embassy in Jerusalem, May 14, 2018. 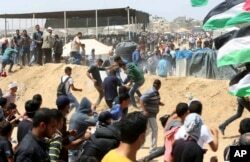 The move came as Israeli forces and Palestinians clashed along Israel’s border with the Gaza Strip. More than 50 Palestinians were killed and hundreds more were wounded. Within 100 kilometers of the violence, American and Israeli officials gathered in Jerusalem for the opening of the new embassy. Late last year, American President Donald Trump rejected long-standing U.S. policy that placed the embassy in Tel Aviv. The United States has now become the only country with its Israeli diplomatic headquarters in Jerusalem. Palestinian protesters run for cover from teargas fired by Israeli troops near the Israeli border fence, east of Khan Younis, in the Gaza Strip, May 14, 2018. Trump’s daughter Ivanka Trump and her husband Jared Kushner, both advisers to the president, attended the opening ceremonies. In a video, the president called moving the U.S. embassy out of Tel Aviv “a long time coming. Jerusalem is the capital of Israel,” he said. Earlier, Trump celebrated the move in a message on Twitter. He wrote, "A great day for Israel!" Israel considers all of Jerusalem as its capital, while the Palestinians want East Jerusalem as the capital of a future Palestinian state. European leaders also objected to the move. British Prime Minister Theresa May said it was “unhelpful” to the goal of peace for the area. Pope Francis said he could not, in his words, “silence his concern over the situation." And UN Secretary-General Antonio Guterres said the move “would jeopardize” the chance for peace between Israel and the Palestinians. 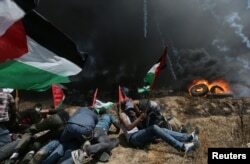 Palestinian demonstrators take cover from Israeli fire and tear gas during a protest against U.S. embassy move to Jerusalem and ahead of the 70th anniversary of Nakba, at the Israel-Gaza border in the southern Gaza Strip, May 14, 2018. In Gaza, thousands of people protested the new embassy. Some protesters threw rocks and other things across the border. Israel fired on the protesters. Israel said the shooting was necessary for security. Many businesses and schools in Gaza were closed. Palestinians were not protesting the embassy move alone. Many were also demonstrating to mark the anniversary of what they call the "nakba" or "catastrophe." Nakba describes the expulsion or fleeing of hundreds of thousands of Palestinians from their homes during the 1948 war surrounding Israel's creation. The new U.S. embassy is currently housed inside an existing U.S. diplomatic building, while a search begins for new, larger offices. The building sits partly on a piece of land that the U.S. government does not officially recognize as Israeli territory. A U.S. State Department official has said the land is “partly in West Jerusalem,” the part of the city recognized by the United Nations as Israeli territory. The official said the rest is “partly in No Man’s Land,” between the lines established by Israel and Jordan. The two sides established those lines as part of a truce signed on April 23, 1949. 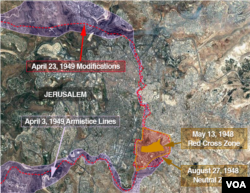 A U.N. official describes that land as “occupied territory,” under two agreements: the Fourth Geneva Convention signed in 1949 and 1907’s Hague Convention. The U.N. official agreed to speak with VOA on condition that he or she not be identified because of the sensitivity of the subject. The Trump administration has said it takes no position on the exact borders of Jerusalem, but does recognize the city as Israel’s capital. George Grow wrote this story for VOA Learning English. His story was based on reports from VOA’s Ken Bredemeier, Chris Hannas, Heather Murdock and Michael Lipin. Caty Weaver was the editor.